Right off the bat Hayes athleticism jumps off film and you see him quickly set his feet and drive the defender back routinely. At 6’3″ he appears to have long arms, or at least he gets consistent leverage on his opponent. He’s versatile too, playing every single position across the line of scrimmage. I like how he finishes off his blocks, he does a great job of driving through with his legs. Hayes is an FBS recruit, especially when you consider that he only played 60% of his season and has this kind of production. Hayes has gained 15 pounds in the last 6 months. He made top 5 offensive lineman at The Opening combine. 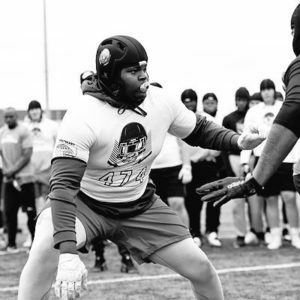 The 2019 recruit needs to build up his body from a strength and conditioning stand point, but cannot deny his raw power and solid fundamentals. Hayes has gained nearly 20 pounds in the last 6 months. He added 60 lbs to his bench press max. At a recent camp we saw him dominating a 4 star recruit in 1 v 1’s, playing with excellent leverage.